◆ the 5.8GHz band or the 2.4GHz band, it is ideal for seamless HD streaming, online gaming and other bandwidth-intensive tasks. ◆ The 5.8GHz 866Mbps is perfect for HD video streaming and lag-free online gaming, while using 2.4GHz 300Mbps Wi-Fi for normal use such as web surfing. ◆ Install the driver from the included CD. After the driver is installed, you can use the built-in wireless utility in your operating system to connect to a wireless network. FAST: Upgrade your WIFI speed to 1200Mbps (2.4G/300Mbps+5.8G/867Mbps), excellent for reducing freezing and lags when streaming and gaming. Ultra-fast AC1200 wireless network adapter speed with 802.11AC. SECURE: Support WEP/WPA/WPA2/WAPI/WPS secure Tech. 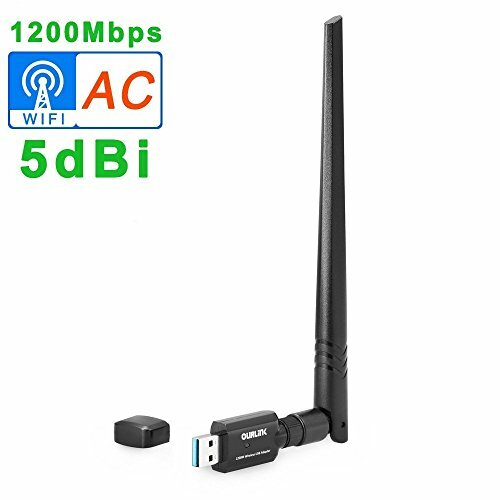 By using AC1200 AC wireless adapter, you can upgrade your PC,laptop or Mac to work with the latest AC WiFi router for faster speed and extended range. POWERFUL: High Gain Long-Range 5dBi Antenna can help you connect even when signals are weak. Quality Service: OURLINK brand products is through CE / FCC / RoHS related certification. We offer 12 MONTH WORRY-FREE WARRANTY, if you have any problems when using, just contact us. We must GIVE YOU A REPLACEMENT or REFUND UNCONDITIONALLY ! If you have any questions about this product by OURLiNK, contact us by completing and submitting the form below. If you are looking for a specif part number, please include it with your message.